Pool companies that provide maintenance and repair services can create a quality control program and improve customer service with this free, printable business plan. [COMPANY NAME] will provide top-quality residential and commercial pool maintenance and repair services to clients in the [CITY] and [CITY], [STATE] area. The principal, [NAME], has 20 years experience and operated this business for 16 years. He has concluded that word-of-mouth referral, the traditional method of marketing in this industry, has become outdated. He will utilize his funding to secure new pool 'routes' by purchasing them from independent sellers. [COMPANY NAME] believes that it can further improve upon and exploit this weakness by adding a company internet website and internet business directories to gain additional local market share. The company will seek to provide its pool maintenance and repair services in the timeliest manner and with an ongoing complete quality-control program to provide 100% customer satisfaction. The company's principal sees each contract as an agreement not between a business and its customers, but between partners that wish to create a close and mutually beneficial long-term relationship. This will help to continue greater long-term profits through referrals and repeat business. • Hire an office manager and lease in year 1; then purchase a headquarters, which will provide a centralized business location. • Have a dedicated route technician manager who can handle major assignments and quality-control issues. • Assign at least one servicemen per route until he reaches the designated total of 8. • Purchase two new route servicing flat bed trucks and two repair and renovation mini vans. [COMPANY NAME] will be located in a 2,000 sq. ft. leased office/warehouse suite in [CITY], [STATE]. The facilities will include a reception area, office for the principal, and storage area for inventory. At the end of year 1 it will acquire a 2,000 sq. ft. facility as a permanent long-term asset. 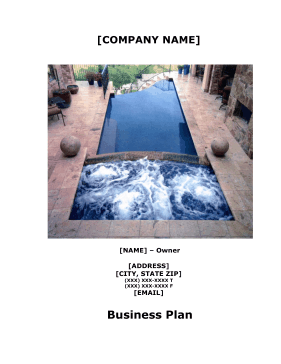 [COMPANY NAME] offers a wide variety of services primarily focused on residential and commercial pool servicing. The firm also provides such services as electrical and plumbing repair and maintenance, pool surface and deck renovation, and well as others. The idea is to provide clients with a broad range of related services that will minimize their need to employ a variety of contractors. [COMPANY NAME], Inc. will engage in a cost effective leadership strategy while maintaining an excellent level of service quality. The company has rigorously examined its financial projections and concluded that they are both conservative in profits and generous in expenditures. This was to provide for unforeseeable events. The company's principal believes that its cash flow projections are realistic. • Achieve sales revenues of approximately $1,000,000 by year three. • Achieve an increase in total routes (blocks of contracted clients) from 3 to 6 routes in year 1 and 8 by year 2. • Purchase a 2,000 sq. ft. office/warehouse facility to serve as a headquarters. • Increase the number of employees from 3 to 6 in year one and maintain 11 by year three. The mission of [COMPANY NAME] is to provide top-quality residential and commercial pool maintenance and repair services. The principal also plans to add leak repair further complimenting its service offerings. The company will seek to provide these services in the timeliest manner and with an ongoing comprehensive quality control program to provide 100% customer satisfaction. The company's principal officer sees each contract as an agreement not between a business and its customers, but between partners that wish to create a close and mutually beneficial long-term relationship. This will help to provide greater long-term profits through referrals and repeat business.